As many know, buses and trains are well subsidized transport alternatives in Europe; Italy is no exception. 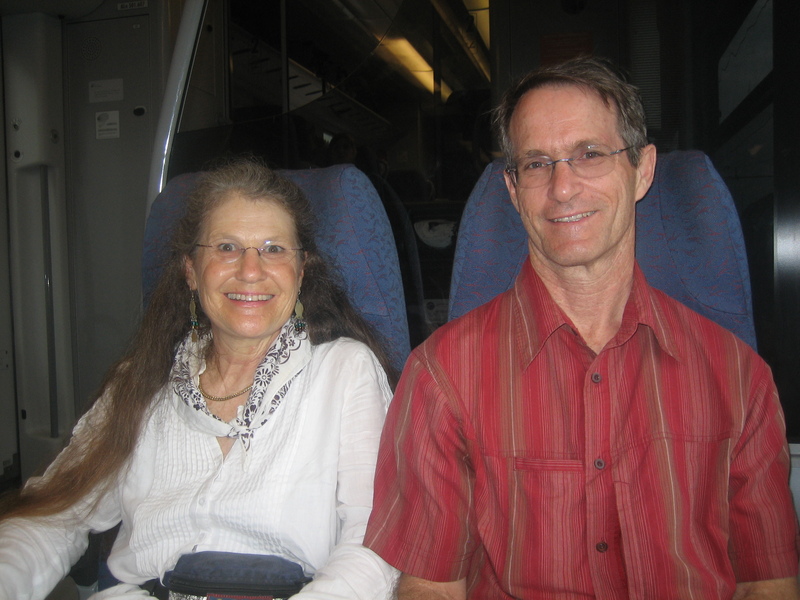 Sherie and I rode two trains from Bossano to Bolzano, local trains that stop often. Probably 150 km, 8.80 Eu per person. 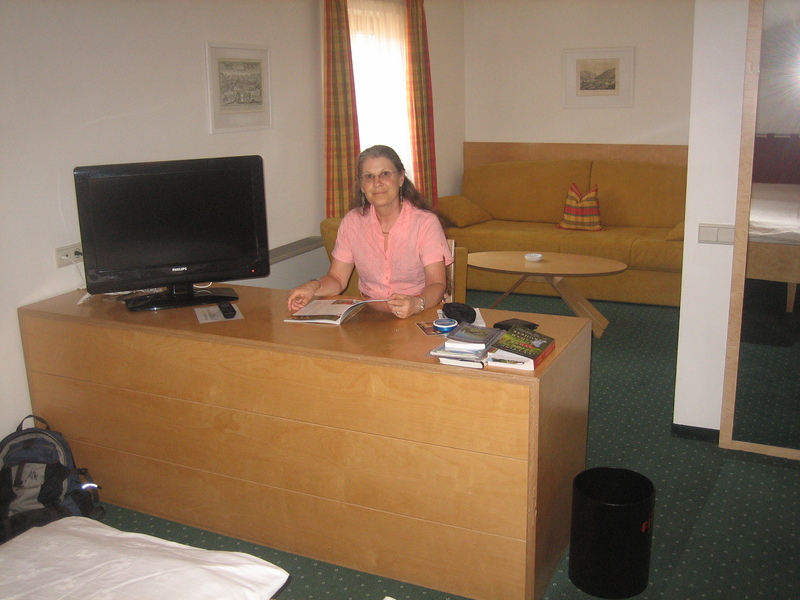 The 10 km cab ride to the train in Bossano cost us 20 Eu, and the 400 meter cab ride in Bolzano cost us 10 Eu. If we had been backpacking, we could have done the whole trip for under 25 Eu each by using the bus in Bossano, and walking in Bolzono. But with bike boxes, one does not want to drag them very far down streets, up stairs, and though crowds. Especially when Ben has two bike boxes, one front and the other behind while Sherie has both roller suitcases of clothes. Even more especially, when one of the bike boxes rented from the club has a missing wheel, and hence a side/corner of the box is dragged on the stone, concrete, cinder-block pavers, brick, and other pavement. Already, after about 400 meters of dragging the box on the train stations and platforms, the corner of the dis-repaired box has a hole a couple centimeters in size, and growing. It seems for now that the open cell foam padding inside is still protecting the contents. 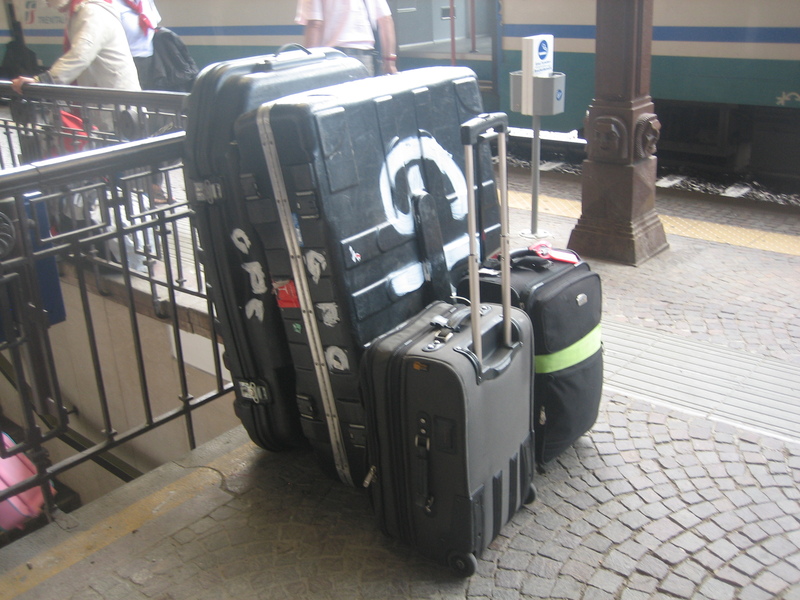 Lets hope that there is less box dragging in the coming days as we take buses to Corvara, then on to Mestre and Marco Polo Airport. Also, a bike box is too large for the luggage storage spaces on the local trains. So Sherie and I had to muscle them up the steps on the train doors (It was a sight to see Sherie pull one up by herself!) and store than protruding into the passageway in the doorway. People, however, were accomodating and squeezed through sideways. But we got them to Bolzano. And in Bolzano we were relieved to find elevators not too many meters from the train doo, that allowed us to avoid the stairs to get from the platform to the street. Ben probably only lugged them 200 meters total here. The cab driver was incredulous when we tod him our destinations, as he said it was only 200 meters away. Really, it is more like 400 meters. But when we lifted them in to the cab, he came better to an understanding of the need. Rant over, if you’ve read this far, thank you. The journey from Bossano to Trento was on a great little two or three car diesel train. Very comfortable, broken into several spaces of different shapes without the traditional compartments, high tech WC, but pretty slow. But the Brenta River valley is so beautiful, cliffs and spires towering above green fields and terraces, white and red villages, into the misty clouds above. 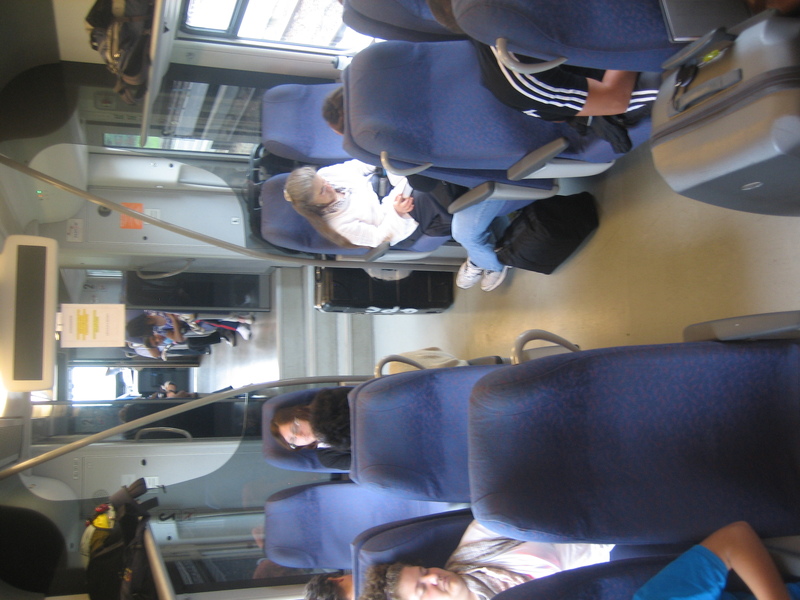 As we neared Lago di Calonazzo, a resort just over the pass from Trento, many German speaking tourists entered the train until it was standing room only. In Trento we transfered to a faster electric train for the 40 minute leg to Bolzano (Bozen in German). 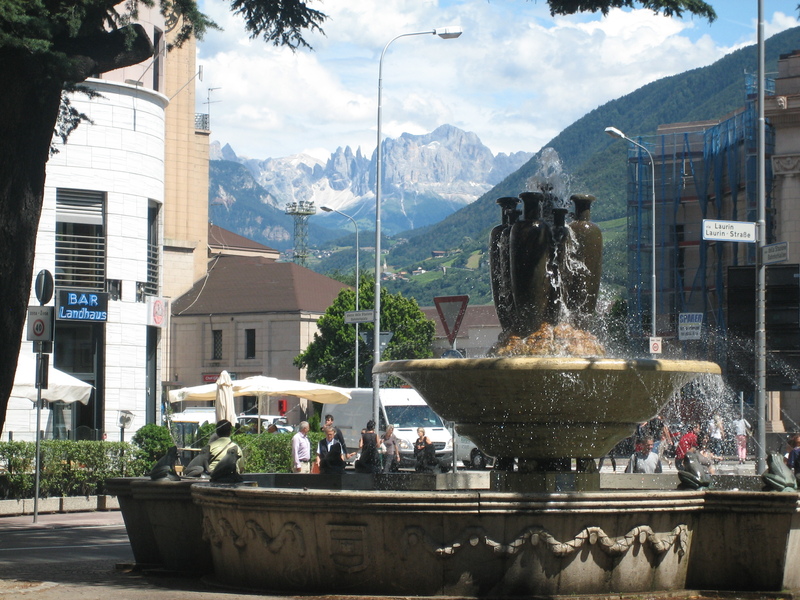 When George didn’t understand why we wanted to go to Bolzano (it is chiefly Germanic culturally), when we stepped off the train I remembered. It is 5 degrees Celsius cooler than the Venetto, and seemed half as humid. And it is a pretty town, walkable and bikeable central district especially, with the old buildings and narrow streets. Above all towers the Dolomite spires, viewed at odd times down the streets. Our hotel Figl is awesome, only three stars but beautiful room and terrace. A bit pricy, but right in the action just a block off the main plaza, with the walking district on all sides. However, we were not so pleased when we saw the place they wanted us to store our bikes. It is outside, around the back and out of site, for sure, and near the kitchen, but locked only “after hours.” The manager(?) of the hotel was very polite but insisted we could not bring them into our room (grease on the carpets, you know) and upgraded our room to a junior suite. We now know him as the bike nazi. I sure hope the bike is there when it is time to leave. Sherie and I split a salad and pizza for lunch, with local draft beers. Very tasty and satisfying. We walked around for about an hour, investigated the town rental bike system (1 Eu for 6 hours! ), the bus arrangements to Corvara (transfer in Plan in Valley Gardena), bought the museum and transport card for three days to cover our upcoming visits. Tired from the travel, and five days of cycling, we napped. Sherie slept from like 16:00 to about 22:00, and Ben caught up on the blog pictures and internet. And for once we did not fall asleep later feeling over-full in the belly. This entry was posted in Cycling, Grizzly Peak Cyclists and tagged cycling, Maratona dles Dolomites. Bookmark the permalink.